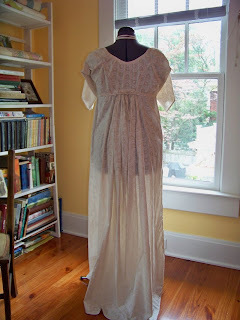 Over the springtime and summertime I engaged in hand-sewing a Regency-style drawstring day dress in a cotton. The project was a sort of giant, fully sewn toile, a grand mockup, for I was less interested in having the perfect dress for events than I was in understanding what it might feel like to construct a day dress by hand. What stitches might have been used during the period, and how would the sewing process feel in the hands? What would the results look like? How would they wear? I am indeed pleased with the results, a plain, untrimmed day dress in a inexpensive cotton print, which still manages to project some grace in its cut and in the texture the stitching imparts to the seams. 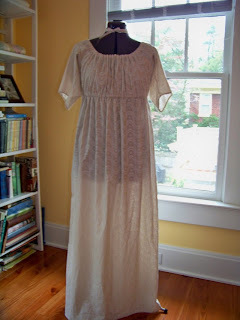 If you look at the Sense and Sensibility site, the Dress Diaries Livejournal site, visit the Regency portion of Katherine's Dress Site or do a simple search, you will find lots of information and numbers of dress diaries covering making this dress, so I will not reprise that here. Instead, in the following posts I will lead a tour of the dress, discussing its construction and what I learned during the stitching process. As always, click on the images to see a -- much -- larger view. First, a grateful nod to my inspiration: the 18th century wardrobe handsewn by brocade goddess for her master's degree and museum exhibition, which was heavily documented on her blog, Rockin' the Rococco, and which I reviewed last fall. I used several sources during the project, and uncovered additional details...some of which blew my ideas away...later. In all the research I tried to stick to formally published secondary resources or primary resources. Here is a resource list. Costume Close-Up: Clothing Construction and Pattern, 1750-1790. Baumgarten, Linda and John Watson. Williamsburg, VA: The Colonial Williamsburg Foundation, 1999. Costume in Detail: 1730-1930. New edition. Bradfield, Nancy. Barming, England: Eric Dobby Publishing, 1968. 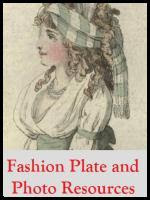 English Women's Clothing in the Nineteenth Century. Cunningham, C. Willett. New York: Dover Publications, 1990. Reprint of 1937 edition. Everyday Dress of Rural America, 1783-1800: With Instructions and Patterns. Wright, Meredith. New York: Dover Publications, 1990. Lady's Guide to Plain Sewing, The. Kannik, Kathleen. Springfield, OH: Kannik's Korner, 1993. Lady's Stratagem, The: A Repository of 1820s Directions for the Toilet, Mantua-Making, Stay-Making, Millinery, and Etiquette. Grimble, Frances, trans. San Francisco, CA: Lavolta Press, 2009. Nineteenth-Century Costume in Detail. Johnston, Lucy. London: V&A Publishing, 2009. Period Costume for Stage and Screen: Patterns for Women's Dress, 1800-1909. Hunnisett, Jean. Studio City, CA: Players Press, Inc., 1991. Workwoman's Guide, The. By a Lady. Second edition. 1840. Accessed on Google Books. I say "primary-ish" because I have no access currently to actual period garments. I drew instead on photographs and notation of garments for sale from well-known dealers, and comments from well-known costuming experts online. Ebay: Women's Vintage Clothing, Pre-1901. Examination of photographs of garments for sale. Sellers followed: "Time-Travelers", "Fiddybee". 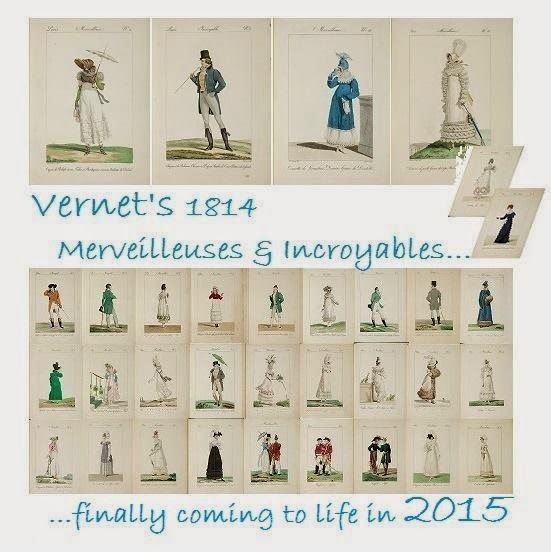 Sense and Sensibility Patterns forum. Comments of costume experts such as Suzi Clarke, Frances Grimble, and "Acacia". I hope you'll find the tour as interesting as I found the construction process! 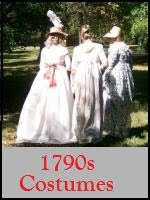 Thank you for posting the blog article about hand sewing a Regency dress. It is what I was searching the 'Net for. You are welcome! By the way, I have learned since that the skirt portion of the dress was often whipped to the bodice portion. The raw top ege of the skirt was turned inside. In the portions of the skirt that were gathered or pleated, this was done. Gathering was often with two matching rows of gathering stitches. Then the finished bottom edge of the bodice and the top of the skirt were laid edge to edge, wrong sides together, and whipped. When whipping the gathers, the valley between each gather would be whipped. These "stroked" gathers would remain common for decades. I have a tutorial on whipped gathers used in a midcentury petticoat. If you examine close-up images from the Metropolitan Museum of Art of Regency dresses, you can often catch glimpses of how the skirt and bodice were joined. Stopping back by for more eye candled and stumbled upon your reply to me. My hat goes off to you sewists that choose historical accuracy in your projects. Every now and again I get a tinge of guilt because I could not care less for myself, that is. After reading Aspiring Homemaker's blog I came to the decision to change my wardrobe from modern to 98% Regency, Edwardian, and 1950's. My reasons were simply for the modesty, COMFORT, and the ladylike look of those eras. I am a poor woman and learned quickly from reading sewing divas like yourself that there is NO WAY I can afford to reach my goal if I insisted on the historical accuracy thing. Yet, I have enough sense to respect those of you who choose to be true to the game. If you should ever want to check out the blog of a semi-wanna-be come see me at http://www.sewandcro.com as I transform my wardrobe. Thank you for being a force on the world wide web. I think that many who make costumes or period dress come at it from slightly unique angles. Yours is for wear, so your construction methods should fit your level of comfort. My angle is research: I want to understand as well as possible what methods were used, with what materials, and how the processes work. Very best, and sure, I'll hop on over for a visit.